She will never have friends. She won’t fall in love. She will never be able to live on her own. She won’t go to college. She won’t get a job. She will never fit in with the others. She won’t be able to travel. She’ll never fulfill her potential. She won’t drive a car. She will never be happy. She will never be the daughter you dreamed of. She can’t even tie her own shoes. She can’t even blow her own nose. She can’t read a map. She can’t catch a ball. She doesn’t know whom she should trust. She can't cross the street. She can’t be allowed to stay home alone. Some of these things she does not care about. Others she might like to try. Some of them, she will have achieved soon after you swore she would not. More important, know that she hears you. She knows you never believed in her. She's sure there must be something bad about someone who couldn’t do everything on your list. She knows that you told everybody you know about what, in her understanding, you saw as her failures. She is angry and hurt. She will try to forgive. She will try to believe in herself. She will do her best to continue growing in positive directions. She will always remember those things you have said. From this, she will never recover. Succint and clearly demonstrates the tremendous damage that parents can do to their children.If you suffered that damage, I am so sorry. I am sorry for those children out there who hear this, hear that they were lost, stolen and need to be cured, recovered. I think this is what most ticks me off when I hear others complain about "their situation" in front of their children (or in media that their children will be able to access in the future). If your own parents aren't in your corner, than who can you count on? I imagine that is the tape going on in a lot of minds and hearts. The tape you can't quite rewind and gets stuck rather. Other people are able to have enlightened witnesses, as Alice Miller talks about, like their friends and teachers. Or even just someone who cares. This is where Temple Grandin's dedicated friend is so important. I like the sentences at the end. And "she is the cat's mother". A person is not a pronoun only. He has no imagination. He doesn't get humor. He'll probably be employed as a night worker, if at all. At age 3, 3 pages of things he can't do. No page of what he can. Thanks to those who woke me up. My family, and the Hub. No one can see the future. well said. "not good enough" still torments me as an adult, and I so try to not do the same to my children. Why do people think it's ok to define us by what we'll 'never' do? just this week i did 10 things I'll 'never' do. This should be required reading for every asshat "autism parent" who frequently makes such judgemental statements about their own children and in front of them. I got a list like that when my first son was diagnosed, followed by the words "He belongs in an institution." He's now doing most of what the doctor said he'd never do. It's doubtful that anyone who is forced by circumstances to lack all of those abilities, is worrying about those around them knowing they aren't capable, when they themselves know they really aren't. The last thing they need is others thinking they can do things they cannot do despite their best efforts. This scenario of emotional reaction is absurd, but not surprising if it is imagined by poindexters who know nothing of experiencing such lack of ability. You should be hearing what those who truly lack that many abilities think and have to say. Most everyone has experience with lacking these abilities. It's called childhood. Usually, it is assumed that the person will acquire many or most of these skills. When certain disabilities are present, that assumption is often reversed. Skills may be acquired later, sometimes much later. To assume they will not creates unneccesary barriers. To catastrophize the fact that not everyone will end up with the same abilities creates other types of unneccesary barriers. Regarding whether or not these types of statements affect self-esteem and self-efficacy, since you have already chosen to characterize my response as "absurd," there is nothing more I can say to that. I can't read a map. I learned to dress myself ages 10. I learned to tie my shoes, wash my hair and tell the time in my teens, altough I still find these difficult. I cannot read a map. I cannot drive and genuinely don't think I'll ever be able to (I don't say this to discourag others from trying, but because I know myself well enough to know that it would not be safe. )I struggle to tell left from right. I wet the bed. I am at University. I have a boyfriend. I have friends. Life is more complicated than you realise. Abilities are more complicated than you realise. Imagination is a powerful tool that people are born with in the same way they are born innocent. To steal that from a person is a terrible crime. I was not thought to be able to do anything, even before I was born because my mother carried me for 10 months, and I never turned. After being born breech in surgery and put on respirators that they contemplated turning off, I wasn't expected to be able to walk or do anything on my own. My body was extremely awkward and had my first accident that required stitches at age 2. At 5 I had an accident where I was barely doing more than walking. I was in traction and then a body cast and had to learn to walk all over again after-wards. I'm still very clumsy and I've had many accidents where I broke bones and required stitches. I wasn't able to do school work and wasn't required to. I only went to school for a few years. I was 30 before anyone treated me as anything other than very unintelligent. I actually had someone tell me I was smart then because of something I wrote. People are still very condescending to me when I talk out loud. I believed that I may be smart at the time but later I learned I wasn't smart or sane. However I wasn't and am not those things either because both are relative judgments. I still have never done school work or a job that anyone would consider an accomplishment. I had a Downs syndrome cousin who died recently. He wasn't expected to live past 20 years old. He was a very happy man who enjoyed life. He was non-verbal until he was 68 years old when his parents died. He was then put in a very nice institution they had saved for. He was happy at the institution as he had been all his life. He may have enjoyed learning to talk at 68 years old, but I don't know that it mattered to him a lot. Over-expectation can steal a persons hope (especially if it's someone elses goals) just like other forms of discouragement but intentionally taking away anything that someone is or may look forward to (whatever method you use) is an assault against them. It's mean and abusive. Thank you for illustrating so clearly the need to remain ever-mindful of how we speak of our children around our children (I'm a parent of a boy with autism). We try very hard to celebrate and emphasize our son's abilities, while also doing our damndest to help him in those areas where he needs support -- and never, ever, ever consider any door closed to him, because he is a *child* whose future is unwritten. Bev, It's not fair to have to wait much longer to get skills, or to never get them. Barriers resulting from lack of ability can't be avoided. I don't like it when others go along assuming I can do things I can't and to extents that I can't. I just don't see how it isn't natural to feel disappointed that one can't do basic things. sanabituranima, I don't think abilities are complicated to make the distribution of them equitable at all. I've lost a lot due to not knowing how to do basic things. I can't comprehened what I read sufficiently, I can't express myself well in words and speech. I have faulty memory. I get confused many times and screw up all kinds of mundane things, and I'm too impaired to be able to drive correctly in enough situations to be able to. I don't have success to justify what little I can do. I have minimal contact with few others in my personal life. All I have are nostalgic but vile memories of previous attempts to have and maintain relationships with others, in which I couldn't experience them to extents that I needed to. I want to pursue so many goals and interests I can't due to my impairment, while I must depend on others and consequently be around them at any time, while having no job to occupy my time. Things aren't just eventually going to turn out alright for all. Ed, I'm not trying to vindicate early unreliable appraisals of skills. It's important to be realistic even while there are efforts to raise expectations through looking for better opportunities in the future. It's time to acknowledge what really is pulling things away from those who are deprived of them. The same ones who lament over the lack of skills and chances of their children, are often the ones who have repeatedly tried and still are trying, to look for chances that their children may gain skills and thrive. They pretty much said the same crap about me. How am I doing stuff like this? This is going to sound strange but I've been able to do this since only the age of 29. All of a sudden I'm able to do this advanced mathematical ability. It scares me sometimes? Bev do you know? Kim do you know? Does anyone know? Thanks for the link to your blog. I don't at all understand the mechanics of how these advanced abilities can develop, seemingly out of the blue. I am familiar with having things finally "click" after years of not understanding something. It can be disconcerting and can shake up your sense of self, maybe as much as losing an ability you've come to see as part of you. Like you, I would be interested in learning more about this. I can see how my comment was confusing but it really had little to do with unreliable early appraisals of skills. I was pointing out that the appraisals weren't necessarily correct or incorrect but skills themselves were not what determined attitudes. I don't know "what really is pulling things away from those who are deprived of them." I don't know what you're referring to. I often see attitudes of discontent as privileged. The attitudes about skills are something I never have been taught I had the right to. By now though I see myself as privileged to not be caught in that trap. Parents attitudes about their children's skill level can be a lot more expensive than the therapy's they buy. It can cost the kid a lot if they adopt those attitudes also. Beautiful. And heart-breaking. Thanks so much for articulating this. "You will never be able to ..."
"You can do anything you set your mind to." I got the latter message as a child, and in my 50s, I'm just beginning to process the frustration, the anger, and the grief of believing I could do whatever I wanted because I was intelligent, as though intelligence is all that matters in this world. The most important message to give to children is that you value the things about which they're passionate. Everything good flows from there. Powerful post, Bev. Thank you. Sanabitur Anima, I have a scattering of abilities similar to yours. I am 25, cannot drive and, based on my experience of trying to learn (repeatedly), suspect I will never learn. Like you, I just don't think it would be safe for me to drive a car. I was twelve when I learned to tie shoes, and ten or eleven when I learned to 1) shower by myself 2) blow my nose 3) comb my own hair. I don't remember when I learned to tell time. For much of my childhood, I could only catch thrown objects by clapping my arms together in front of me --- only later could I catch things with only my hands, and I think I was in high school before I could catch anything one-handed. I learned to speak somewhat early, but couldn't really carry on a conversation until much later; late childhood or early adolescence. I have lived on my own for maybe seven or eight months, my last year of college; I felt overwhelmed by all the stuff I had to remember to do every day, and would let a lot of things slide. I live with my family now, and would not want to live entirely alone again; I don't trust my ability to take care of myself indefinitely. I don't work, never have, and am pessimistic about my chances. I have two college degrees, and maintained a GPA above 3.5 throughout college, while taking 15+ hours every semester. I can sew well, and learned to sew as a child. I alter and mend my own clothes. I can also cook well, and learned to do that during and after college. I can balance a checkbook; have done so since high school. I have had friends at every stage of life, and tend to form very close, lasting friendships. I speak two languages, however haltingly. I am in a romantic relationship of nearly four years. Every year, my communication skills, self-care abilities and emotional intelligence improve. My problem with such a she'll never do this that or the other list is HOW DO THEY KNOW THIS? Do they have some sort of crystal ball or something? I'm still not sure where I am on the spectrum, but I've been told, "you'll live with your parents when you're 30." I'm 30, and I do live on my own. I haven't learned to drive though. Driving is scary. Especially in MA. I do not have a boyfriend yet, mostly because I'm shy, but who knows what will happen one day? Why don't folks realize everyone's path is different? How can they learn to fit in if you put them on the outside and don't think about the things they CAN do and can accomplish? How do these folks know that this person will not be happy living a life that is different than what her parents imagined? This is one more thing, one more negative way to raise children that needs to burn along with the belts and paddles. what about all the things the child can do ?? its not about CAN'T, its about CAN !! Hi Bev, I think it's the first time I'm commenting here -- got to your blog a while ago from another. I'm not autistic nor do I have immediate family members who are, but I have to tell you, your posts speak to me so strongly. You are very perceptive, and express yourself so well. It makes me wonder (if you don't mind me asking) -- does writing, or thinking/speaking to yourself (analyzing situations, attitudes, emotions etc) -- does that come easily to you? Because on one hand, you convey so well how it can be hard to communicate verbally in day to day conversations with impatient people, but on the other hand it's almost hard to believe that you have any problem forming (perceptive an enlighting) ideas and communicating them effectively, given your writing ability. Wow, sorry for writing so much. Here's a shorter version of my question: Does the problem with daily conversations stem from the rushed and stressful environment, or does it stem from the fact that the topics you are "supposed" to discuss in those situations are not those that you are interested in discussing at that point in time? In any case thanks for a great blog in general, and this particular entry in particular. It was very touching, and I feel enlightened me as a mom (and a person), regardless of autism. Thanks for your questions. Do thinking and writing come easily to me? I wouldn't say that, really. Sometimes I write very slowly. Sometimes ideas take a very long time to gel. I think the seeds for this post (as well as the last two) have been with me for a year or more. I don't always feel that I have control over when an idea will be fully developed enough to post. If you look through the blog you will see several long periods of inactivity. Sure, I could have posted something there, but not something that would have met my standards. I would rather wait until I feel I really have something ready to say. This makes academic work hard. Papers have due dates. Sometimes I put 100 hours into something while other students produce their papers in 10 or less. I work on writing constantly, but go through weeks at a time where there is nothing I think is valuable. However, in these throwaway pieces, there is usually some small part I can pick up and use later; the time is not wasted. As far as problems with speaking go, I have several posts where I try to explain what I know about it. Look under tags like "conversation" and "communication" to read more about that. But the short answer is, it can be any or all of the things you name but none of them account for it completely. Writing and speaking are two very different things for me. I know that they seem closely related to most people, but for me, they simply are not. The best analogy I can direct you to is a YouTube by Amanda Baggs called "If You Can Do X, Why Can't You Do Y?" You should be aware that when you use language like "it's almost hard to believe," you risk alienating people like me who have too often been accused of lying or exaggerating about this. I understand your questions to be sincere, however, and that's why I have answered you as I have here. Sorry, I meant to say nicegirlphd. Didn't mean to mix up your name. I'm not autistic. And I don't have language related abilities. But I do have more than 10 years of professional experience with writing. By "professional experience," I mean that I have kept a roof over my head and food in my stomach by renting out my ability to write very well to employers willing to pay well for that ability. So I, too, am accustomed to having people tell me that I "write well." In my professional and not so humble opinion, one of the many things that makes a person a "good writer" is the ability to express ideas in a way that is easy for the reader to process, or at least as easy as the complexity of the ideas and the capacity of the reader permit. In other words, if you find it easy to read, then the writer has probably done a pretty good job of writing it. But here's the thing. Just because something is easy to read doesn't mean it was easy to write. In fact, you could extend this simplification to a great many activities in life. Just because ballet looks easy when a talented troupe of dancers glide prettily across the stage doesn't mean that they didn't spend years of practice and shed a river of sweat from physical exertion making it look that way. Readers don't see the hours of writing and re-writing and re-writing and re-writing ... or the hours of staring at a blank screen with an equally blank mind ... or the hours of bouncing around the apartment putting dishes away, playing computer games, or other seemingly unrelated activities while desperately trying to prod the subconsciousness into working on the next written piece in the background. Readers don't see these things, or the associated tears of frustration (sometimes literal), because they're not supposed to. That highly polished blog post, magazine article, short story that took you 30 minutes to read? Probably took, at bare minimum, hours to write, or maybe weeks. And in some cases that moving, articulate piece may have been sitting in some corner of the mind germinating for years, in an amorphous blob of inarticulate but strongly felt emotion before it finally emerged in some form that could have words wrapped around it that might make sense. All of this is true for any good writer who does *not* have any additional difficulties to snarl the writing process. As someone with attention deficit disorder who has struggled just with finding enough concentration to string a sentence together, never mind a whole paragraph, article, speech, or book, I can tell you that certain impairments do make a messy process even messier and more frustrating. The end result of that process may still be something that people praise as "good writing." But many people, even teachers and my own parents, are astonished to learn how many hours of effort I may have needed to pour into that seemingly simple, article paragraph. I have enough talent that I may sometimes (if you catch me on a very good day, and on a subject I have already thought about quite extensively for years) be able to dash off in moments something that some others might find more of a struggle to achieve. But just because maybe sometimes it seems "easy" for me to write doesn't mean that it is *always* this easy. The sporadic moments of seeming ease only serve to further mask the effort that it can take to write something not on a good day, or on a topic that maybe I haven't needed to think much about before. 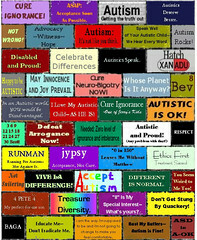 Because of all this, I have no difficulty in grasping why people like Bev (or Amanda, if you have read her excellent blog at ballastexistenz.autistics.org) can write so well and yet find it so much of a struggle to write at all. There is no contradiction in this concept. There is less correlation than many people realize between "good writing" and "easy writing." Again, all of this is inherent to the nature of writing itself. The addition of other issues such as attention deficit disorder (for me) or language processing disorders or whatever else (for others) simply compound all of this. There is tons more I could say about this. (In particular: If a good writer is not necessarily someone who finds writing easy to do, then what is a good writer? Itself a lengthy and possibly, albeit more tangentially, related discussion.) But I think I've made the most essential point I wanted to make so I'll stop here. Thank you, Andrea S. That's it exactly. The time a "good" writer puts into writing and refining is simply not available when speaking. It is perceived as "odd" to comment on a topic ten minutes after everyone has finished with it and moved on to the next subject. People get frustrated with this (especially when there is a group and some autistic or other slow processer is messing with their conversational fun) and are likely to ignore the late arriving contribution in favor of continuing what they are talking about now. I use a number of tactics for participating, including taking notes and raising my hand. These are often accepted by people who actually have the intention of including me. First, I want to apologize for using the "hard to believe" language. Once you commented on it (thanks for doing it) I immediately realized it -- I've read enough that I should have known better. I am sorry. And I'm glad you understood my questions as sincere. I want to explain that by "hard to believe" I referred to my own gap in understanding, and it was a very poor choice of words -- I have (and had) no doubt that it is true (who am I to doubt your experience anyway! ), I was just having difficulty understanding how it's possible. I understand much better now -- thank you Andrea S. and Bev for taking the time to help me understand (I realize you do not have to explain this to me, my lack of understanding is not your responsibility to solve, and I appreciate your answer). The reason I didn't understand it, is that for me the difficulty I have in expression, is that it is hard for me to pinpoint the main thing I want to say, or express it well (exactly like Andrea S. said, it should be easy for people to understand, and that is hard for me to do, both in speaking and writing). It seemed to me that Bev has no problem pinpointing important and subtle points and expressing them extremely clearly in a way that makes you think 'yes!! ', so I was surprised that it is hard to do so verbally. I appreciated that the time pressure and focus is a factor, but I didn't understand how important it is. Thanks again for explaining. And thank you both for pointers to youtube / blog that I intend to check out. oh, and no problem about mixing my name. (part of what I like about you, is your respect and sensitivity - this demonstrated it again). the thing that struck me in your list was blowing your nose. i found it impossible to explain to my son how to blow his nose - its not something that you can show someone like tying shoes or whatever as all the action happens inside! most of our relatives seem to have very odd nose-blowing techniques which shows how many in our tribe are on the spectrum. Brilliant...actually brought tears to my eyes. Most people with a congenital disability and many of those with an acquired disability (depending on the age they are when they become disabled) are caught in a “cycle of negativity”. For example, from the moment a person with a congenital disability is born, the general reaction to their disability and therefore to themselves is one of negativity. As babies, toddlers and children they will hear people saying things like “what a shame she is like that” or “it’s a pity she survived”. The medical profession will talk about them in front of them about their inability and their deformed bodies or minds. They will be paraded in their underwear and poked, prodded and operated upon. The medicos will be the “experts”, the ones who know how wrong these children are, and they will say so. Often opinions will be expressed as to the capacity of these children to “perform”. Doctors and physios will say “she will never walk, talk, read a book, laugh, respond to you, drive a car, get married, etc”. They will not be expected to achieve anything, they will be teased by other children, stared at in public and avoided by other people. This is the cycle of negativity. This negativity seeps through to the child’s core and leads to them having a very low opinion of themselves. They may see themselves only as useless and a burden. When a person with a disability fails to achieve because of discrimination, lack of opportunity or poverty no one will recognise that those are the reasons. They will see the failure as an innate part of the person and therefore not anyone else’s responsibility. The failure will confirm the earlier predictions by doctors or parents or friends. They will confirm their own rightness. But for the person with the disability the negativity goes on. This cycle does not ever stop. Even after a person with a disability dies people often say what a blessing it is that they are free. Those people never consider that they all had a hand in building the prison of Negativity.